Boris Karloff returned to England for the first time since setting sail for Canada in 1909 in order to make this really rather awful horror for Gaumont-British, overseen by Michael Balcon and directed by T. Hayes Hunter. Long thought lost, The Ghoul was the source of no little disappointment when a copy was finally unearthed by William K. Everson in Communist Czechoslovakia in 1969. An adaption of Frank King's 1928 novel of the same name (also a popular stage play of its day by the author and Leonard J. Hines), Karloff stars as Professor Henry Morlant, a dying Egyptologist who believes the ancient god Anubis will grant him immortality in exchange for the return of a priceless jewel once excavated from a pharaoh's tomb. Morlant swiftly shuffles off this mortal coil and is buried according to Egyptian custom with the gem bound in his fist, only for it to be pilfered by an untrustworthy acquaintance soon after. Morlant rises from the grave to retrieve his property, haunting his in-laws, loyal Calvinist man servant (Ernest Thesiger), villainous lawyer (Cedric Hardwicke) and a pair of nefarious Arabs, all of whom have joined in the treasure hunt around the dead man's dusty manor. 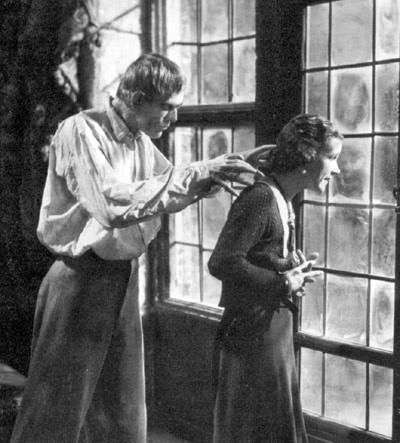 Karloff was only available for the picture having hit a deadlock in contract talks with Universal, who had wanted him to take a pay cut for their forthcoming adaptation of H.G. Wells's The Invisible Man (1897). Presumably some wily executive thought the studio could get away with reducing his salary because audiences wouldn't actually be seeing Karloff on screen. Instead, he was loaned out to Gaumont and leapt at the chance to return home, as biographer Stephen Jacobs recounts in a post over at The Spooky Isles, which is well worth reading. 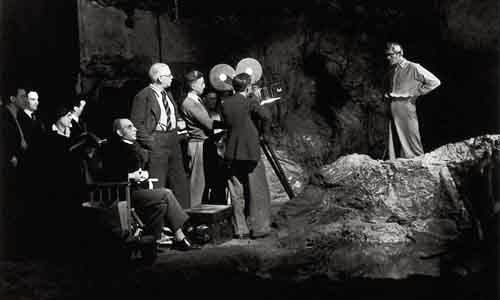 The resulting film was an obvious cash-in on the success of its star's two previous hits, James Whales' The Old Dark House (1932) and The Mummy (1932), directed by Karl Freund. The Ghoul has a great many faults and is only redeemed by its impressive cast and exquisitely gloomy, candle-lit photography from German expressionist maestro Günther Krampf, who had served as cameraman on the silent classics Nosferatu (1922) and Pandora's Box (1928). 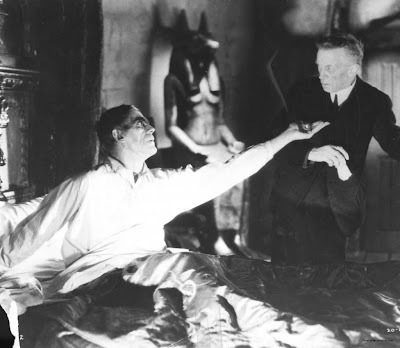 Karloff is actually badly misused by the screenwriters, Angus MacPhail among them: killed off in the opening scene, he only returns late on and is then inexplicably unable to talk, staggering around and groaning like Frankenstein's monster or the bandaged Imhotep without cause. Meanwhile, Morlant's relatives, a pair of bickering young cousins played by Dorothy Hyson and Anthony Bushell, are wrongly foregrounded as the focal point of interest, with the hot-headed Bushell in particular guilty of some hilariously stagy and abrupt line readings. Hyson is meanwhile asked to faint twice and her cowardly spinster friend Kaney (Kathleen Harrison), the film's utterly unnecessary but endearing comic relief, also passes out through shock, none of which helps advance the plot one iota. Hardwicke and Thesiger are utterly wasted wandering around in the dark while all this squabbling is going on and very little is resolved at the conclusion. The film did at least have one admirer. Future knight of the realm Ralph Richardson, who made his screen debut here as a suspect parson, fondly remembered The Ghoul in conversation with Roy Plomley on the BBC's Desert Island Discs in 1979, claiming that he'd managed to snag the best part and recalling laughing at Karloff for having to spend so long in make-up while all he had to do was slap on a dog collar. Federico Fellini's most iconic and celebrated film remains as enviably stylish as ever. La Dolce Vita was always wildly ahead of its time, from its episodic, freewheelin' structure to its bold breakaway from drab post-war neorealism, inviting us to revel in the glamour and spectacle of the irresponsible Roman rich at play rather than mourn for the nobly impoverished. What is less often said about the film is just how savage and prescient it is as a critique of rabid modern media culture. 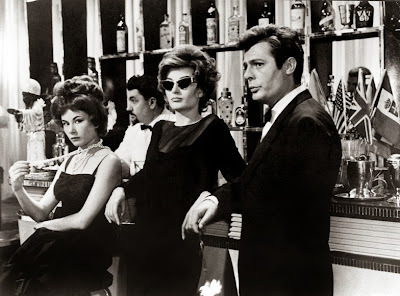 Fellini's protagonist Marcello Rubini (Marcello Mastroianni) is deeply conflicted about his career as a hack reporter, enjoying the interesting women he encounters (Anouk Aimée, Anita Ekberg, Nico) and the bacchanalian parties he attends in pursuit of a story for his tabloid paymasters but loathing the sleaze and exploitation demanded of him and longing for a more respectable, meaningful way of life. This is surely a universal dilemma for any self-respecting member of the Fourth Estate that endures to this day. On the one hand, Marcello relishes his helicopter ride as the statue of Christ the Labourer is airlifted out of the Eternal City in the opening scene and can hardly believe his luck when splashing about in the Trevi Fountain with the unbelievable Ekberg. On the other, Marcello is exasperated when he is expected to bury his cynicism to report on a "miracle" sighting of the Madonna in the provinces and repulsed when a colleague asks him to use his credentials to gain access to a crime scene after his erudite friend Steiner (Alain Cuny) has murdered his own children with a shotgun before committing suicide. The moral compromises that are all in a day's work for the yellow press have rarely been more explicitly or bitingly addressed and Fellini and his co-writers Ennio Flaiano and Tulio Pinelli deserve every credit. Their greatest legacy in this regard, however, was the decision to name Marcello's ambulance-chasing photographer acquaintance Paparazzo (Walter Santesso), a choice that gave the world a term for these previously nameless buzzards of privacy invasion. Woody Allen had a crack at an updated version of La Dolce Vita when he made Celebrity in 1998 but perhaps the true heir to Fellini is Paolo Sorrentino, whose recent masterpiece The Great Beauty (2013) was closely modelled on the film. The brilliant Toni Servillo's columnist Jep Gambardella stands in for Mastroianni to guide us through the decadent nightspots inhabited by the wealthy elite that today comprise the privileged 1% of Berlusconi's Italy, a land otherwise brought to its knees by political and economic turmoil. Jep, elegant, quietly amused but something of a disappointed romantic, leads us from the rooftop raves and Botox parties of these fabulous creatures to the Polish strip clubs where they crash out and see in the dawn, oblivious to the hardship and ruin all around them. "We're all on the brink of despair, all we can do is look each other in the face, keep each other company, joke a little... Don't you agree?" Jep concludes. Half a century on, little has changed, Sorrentino tells us. Charles Laughton's London street poet Charlie Staggers is chagrined when an impoverished young waif known only as Liberty (Vivien Leigh) steals his takings one afternoon in Covent Garden and angrily pursues her home to the derelict townhouse she's squatting in. There he finds Liberty dancing alone in the moonlight (a standout scene) and takes pity on her, eventually adopting her as his protégé. Forming a performance troupe with his strange friends Gentry and Constantine (played by theatre director Tyrone Guthrie and harmonica virtuoso Larry Adler respectively), Charlie and Liberty prove popular with the public, while the latter catches the eye of influential West End entrepreneur Harley Prentiss (Rex Harrison), who promptly whisks her away and launches her career on the stage. Poor Charlie, who had hoped to marry his beloved "Libby", instead falls on hard times and turns to drink, all but forgotten by the orphan girl made good. It has to be said that the young Leigh's Cockney accent comes and goes a bit in this reworking of a script by Clemence Dane for Laughton's Mayflower Productions, but she has energy to burn and the camera absolutely adores her. Liberty's ruthless streak and habit of using people to get ahead could perhaps be seen to echo aspects of the troubled actress's own personality, although the role had originally been intended for her co-star's wife Elsa Lanchester, with Leigh chosen instead due to her contemporary success on stage in Ashley Dukes' play The Mask Of Virtue. 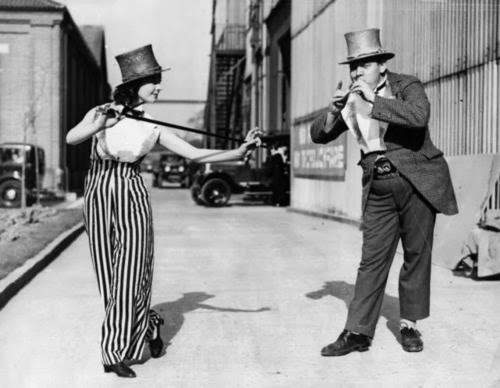 Laughton meanwhile, an uncredited co-writer and producer, found a fine vehicle for his peculiar talents and makes Charlie's plight very affecting (although apparently he didn't get on at all well with his leading lady on set). Irish-American Tim Lewis keeps things ticking along nicely, with help from future director Robert Hamer on editing duties, and the result is a touching if predictable melodrama, essentially A Star Is Born with theatre queue buskers. The Americans didn't take to it when it was retitled Sidewalks Of London, finding the accents impenetrable and the staging of the musical numbers lacklustre by their own high standards, but I must say I found plenty to enjoy. This sterling comedy from MGM-British stars Robert Taylor as Lee Sheridan, the titular all-American star of track and field, who wins a place at Oxford University and makes a big impression, overcoming a number of comic cultural misunderstandings, practical jokes and a ceremonial debagging before leading the city of dreaming spires to victory over Cambridge in the annual boat race. 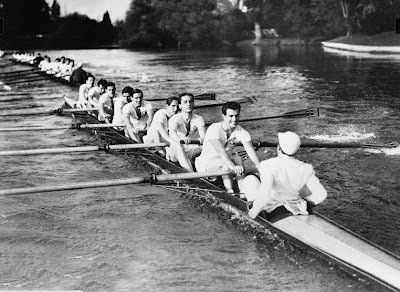 Taylor was previously known as something of a soppy romantic lead but successfully managed to break free from typecasting here by playing an athletic jock, bulking up for the part and convincing as a champion sprinter and rower, so much so that A Yank At Oxford was originally billed as, "The Bob Taylor picture you've always wanted!". 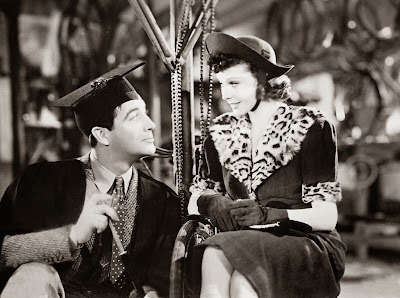 The inevitable romantic interest is supplied by Maureen O'Sullivan as a fellow student but it's the actress's old school friend, Vivien Leigh, who makes the greater splash as Elsa Craddock, the promiscuous wife of a dull local bookseller. Leigh's performance here apparently did much to secure her the part of Scarlett O'Hara in David O. Selznick's blockbusting Gone With The Wind the following year. I saw Jack Conway's film screened as part of a Leigh retrospective at the BFI and it was, fittingly, one of her lines that got the biggest laugh, coming during a scene in which she casually informs a college dean (Edmund Gwenn) that she and her husband have decided to close up shop to escape scandal and the temptations of the student body and move away to Aldershot, a famous army town. Taylor is sporting, redoubtable, two-fisted and no-nonsense as Sheridan, recalling to my mind Gary Cooper as Frank Capra's Mr Deeds. Among the supporting cast, Griffith Jones and Robert Coote are believable as Sheridan's fellow collegians but there are also two touching elderly turns to relish: Edward Rigby as Scatters, Sheridan's sentimental butler, and C.V. France as an endearingly doddery old don, insistent that our man's name is Jenkins. Lionel Barrymore is also in the mix, supplying his usual brand of cantankerous bluster, this time as Sheridan's father, a proud Midwestern newspaperman. A Yank At Oxford's screenplay, from an idea by John Monk Saunders developed by Sidney Gilliat, Leon Gordon and Michael Hogan, was credited to Malcolm Stuart Boylan, Walter Ferris and George Oppenheimer, but also featured contributions from a number of other studio writers, including future Ealing scribe Angus MacPhail, playwright Ronald Pertwee and novelist F. Scott Fitzgerald, who reportedly added several passages of key dialogue. Ealing legend Michael Balcon produced the picture and was slated to direct before falling out with Louis B. Mayer. 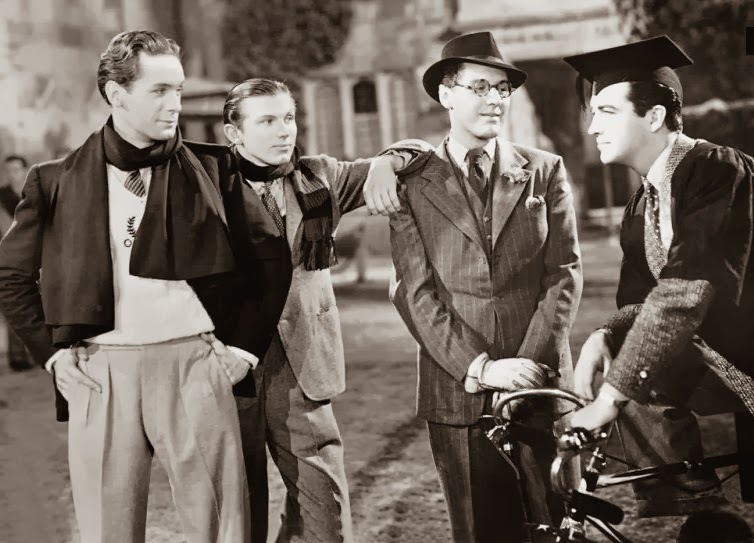 The film spawned an affectionate Laurel and Hardy spoof, A Chump At Oxford (1940), and an imitation sequel, A Yank At Eaton (1942) with Mickey Rooney. As an Oxford native myself, I was delighted to see the city so well recreated in a picture of this vintage and particularly enjoyed the thought of Taylor being cast off the train at nearby Didcot, now home to an unsightly power station. 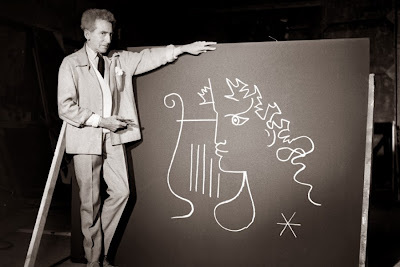 Jean Cocteau was long preoccupied by the myth of Orpheus, the ancient Greek minstrel who descended to the underworld to rescue his beloved Eurydice before meeting a tragic end, and returned to the tale several times in his pursuit of cinéma fantastique. This version relocates Orpheus to contemporary France and casts Jean Marais, Cocteau's Beast and muse, as an arrogant, lyreless poet who encounters Death in the guise of a mysterious princess (María Casares) at a St. Germain café when she arrives to collect the soul of his drunken rival Cégeste (Edouard Dermithe), who has been abruptly run down by a pair of mysterious motorcycle policemen. Orpheus returns to his wife Eurydice by hitching a lift with the princess's emissary Heurtebise (François Périer) but finds her company stifling compared to that of the mysterious femme fatale and becomes obsessed with cryptic poetry being transmitted over the radio. Heurtebise meanwhile falls for Eurydice having taken up residence in Orpheus's home and facilitates the latter's entry into the afterlife via a rippling mirror once she has been killed by the motorcyclists. There Orpheus faces a tribunal and wins the right to return to the land of the living with his bride, only to realise that he has fallen in love with the princess. 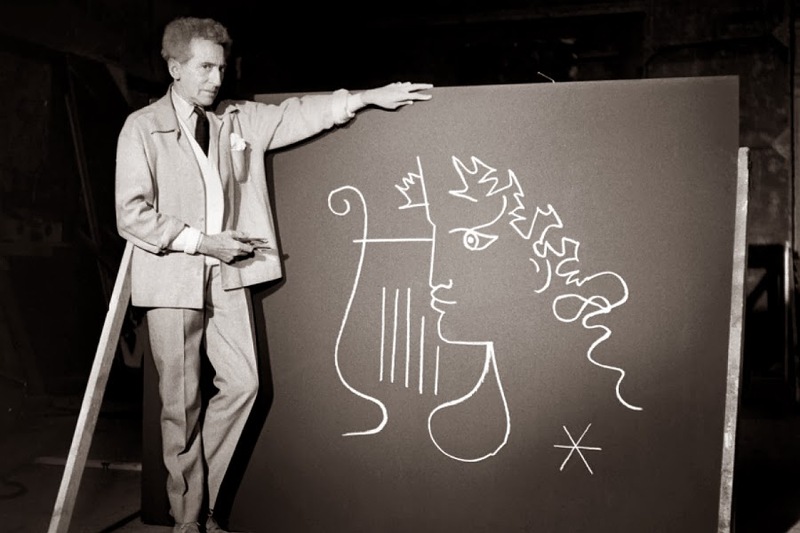 There is much to recommend Cocteau's atmospheric, dreamlike and idiosyncratic Orphée, but I have to admit I found his embellishment and complication of the myth unwelcome and counter-productive. John Keats's confession from 'Ode On A Nightingale', "I have been half in love with easeful Death", becomes quite literally the case here as a means of emphasising the creative artist's necessary dalliance with immortality and otherworldly matters, but where does that leave poor Eurydice? A beauty once worth dying for becomes the embodiment of mundane, bourgeois domesticity and a trap from which Orpheus should strive to free himself. Meanwhile, the operatic tragedy of his breaking his promise by looking back at her, when he has been expressly forbidden to do so, is utterly undone by the director's decision to play it for farce. The poet finally catching her gaze in a car's rear-view mirror feels anticlimactic when it should deliver exquisite agony. Cocteau goes out of his way to introduce symbolic touches that nod to the tense postwar environment, notably the bomb-damaged ruins of the underworld, but the fascist-uniformed angel of death bikers are ludicrous, it has to be said. 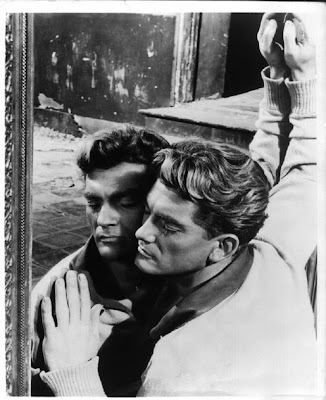 It has been suggested that the director perhaps felt the need to account for his failure to support the French Resistance - despite personally having suffered violence at the hands of homophobic right-wing thugs - and is addressing the matter through Eurydice's hearing in his own peculiar way. Despite Orphée's not wholly successful eccentricities, there's plenty of luxuriant, noirish cinematography to enjoy from Nicolas Hayer, some pleasing trick photography and bold performances from Marais, Casares and Périer, not to mention an appearance by chanteuse Juliette Gréco as Aglaonice, leader of the Bacchantes. A highly original stylist, it's fair and just that this créateur complet and friend to Picasso, Stravinsky and Erik Satie should have been hailed rather than trashed by the likes of Truffaut and Godard who followed in his wake. An early Sam Goldwyn production, not long after the future studio mogul had changed his name from Samuel Goldfish and packed in the glove business for good, Hungry Hearts is an extremely moving silent melodrama about one Jewish family's journey from daily oppression in the shtetls of Tsarist Russia to the promise of a better life in the New World. Like so many immigrants before them and after, the Levins take up residence in a shabby tenement house on New York's Lower East Side and work their way up from nothing, encountering hardship and opportunistic villainy before prevailing in the pursuit of happiness. The film's story is taken from a novel of the same name by Ania Yezierska and, although Hungry Hearts is undeniably both highly conventional and sentimental, its universality ensures that it continues to resonate. E. Mason Hopper's feature accurately captures the immigrant experience and the bustle of turn-of-the-century New York and is anchored by two marvelous performances from its female leads. Rosa Rosanova is impressive as formidable matriarch Hanneh Levin, forced to hold the family together when her scholarly but ineffectual husband (E.A. Warren) fails, particularly in the unforgettable scene in which Hanneh destroys her kitchen with a meat cleaver after a bullying landlord doubles the rent on the grounds that the Levins' apartment has become too luxurious (she's painted it white in a bid for grandeur). Hanneh, haunted by memories of Cossack brutality and motivated by a desperate love for her family, is as real and poignant a character as I've seen on the big screen. The beautiful Helen Ferguson is also heartbreaking as eldest daughter Sara: determined, ambitious and touchingly vulnerable. Her romance with young lawyer David (Bryant Washburn), a son of the previous generation to pass through Ellis Island, finally secures the Levins their suburban security, but it's a hard won victory and one that we greet with a cheer at this very human film's close. 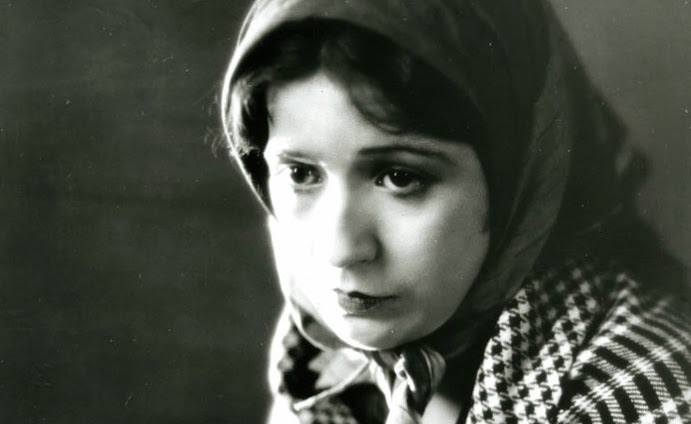 I was lucky enough to see Hungry Hearts screened at the Barbican in London as part of the UK Jewish Film Festival 2013 with a live accompaniment by talented multi-instrumentalists Robin Harris and Laura Anstee and cannot recommend it highly enough. "Other people, so I have read, treasure memorable moments in their lives... What I remember is the time John Wayne killed three men with a carbine as he was falling to the dusty street in Stagecoach, and the time the kitten found Orson Welles in The Third Man"